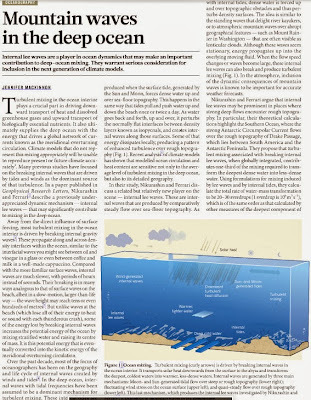 More problems for the models: An article published today in Nature says "a new player on the scene" called "internal lee waves" are "a player in ocean dynamics that may make an important contribution to deep-ocean mixing...Climate models that do not represent this mixing appropriately will be unable to reproduce present or future climate accurately." According to the article, current IPCC climate models do not include this deep-ocean mixing from lee waves, which "warrant serious consideration for inclusion in the next generation of climate models." Internal lee waves are a player in ocean dynamics that may make an important contribution to deep-ocean mixing. They warrant serious consideration for inclusion in the next generation of climate models. 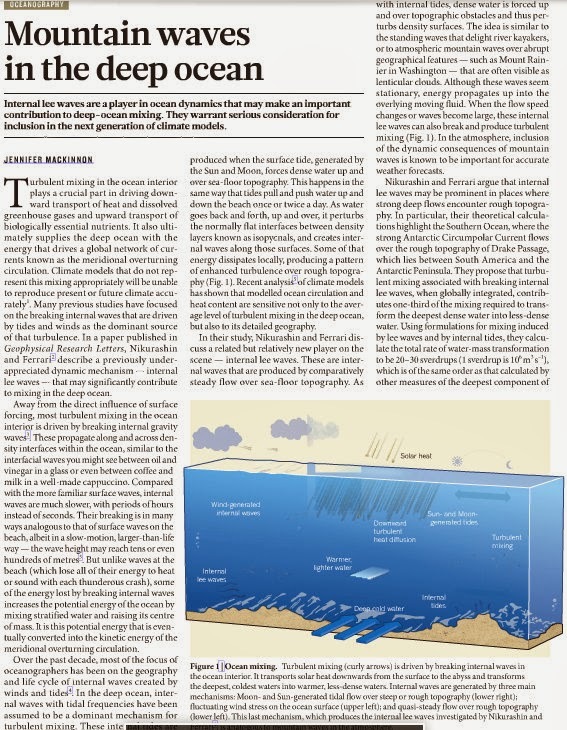 Turbulent mixing in the ocean interior plays a crucial part in driving downward transport of heat and dissolved greenhouse gases and upward transport of biologically essential nutrients. It also ultimately supplies the deep ocean with the energy that drives a global network of currents known as the meridional overturning circulation. Climate models that do not represent this mixing appropriately will be unable to reproduce present or future climate accurately. Many previous studies have focused on the breaking internal waves that are driven by tides and winds as the dominant source of that turbulence. In a paper published in Geophysical Research Letters, Nikurashin and Ferrari2 describe a previously under- appreciated dynamic mechanism — internal lee waves — that may significantly contribute to mixing in the deep ocean. Away from the direct influence of surface forcing, most turbulent mixing in the ocean interior is driven by breaking internal gravity waves3. These propagate along and across den- sity interfaces within the ocean, similar to the interfacial waves you might see between oil and vinegar in a glass or even between coffee and milk in a well-made cappuccino. Compared with the more familiar surface waves, internal waves are much slower, with periods of hours instead of seconds. Their breaking is in many ways analogous to that of surface waves on the beach, albeit in a slow-motion, larger-than-life way — the wave height may reach tens or even hundreds of metres3. But unlike waves at the beach (which lose all of their energy to heat or sound with each thunderous crash), some of the energy lost by breaking internal waves increases the potential energy of the ocean by mixing stratified water and raising its centre of mass. It is this potential energy that is even- tually converted into the kinetic energy of the meridional overturning circulation. Over the past decade, most of the focus of oceanographers has been on the geography and life cycle of internal waves created by winds and tides4. In the deep ocean, inter- nal waves with tidal frequencies have been assumed to be a dominant mechanism for turbulent mixing. These internal tides are produced when the surface tide, generated by the Sun and Moon, forces dense water up and over sea-floor topography. This happens in the same way that tides pull and push water up and down the beach once or twice a day. As water goes back and forth, up and over, it perturbs the normally flat interfaces between density layers known as isopycnals, and creates inter- nal waves along those surfaces. Some of that energy dissipates locally, producing a pattern of enhanced turbulence over rough topogra- phy (Fig. 1). Recent analysis5 of climate models has shown that modelled ocean circulation and heat content are sensitive not only to the aver- age level of turbulent mixing in the deep ocean, but also to its detailed geography. In their study, Nikurashin and Ferrari dis- cuss a related but relatively new player on the scene — internal lee waves. These are internal waves that are produced by comparatively steady flow over sea-floor topography. As with internal tides, dense water is forced up and over topographic obstacles and thus per- turbs density surfaces. The idea is similar to the standing waves that delight river kayakers, or to atmospheric mountain waves over abrupt geographical features — such as Mount Rainier in Washington — that are often visible as lenticular clouds. Although these waves seem stationary, energy propagates up into the overlying moving fluid. When the flow speed changes or waves become large, these internal lee waves can also break and produce turbulent mixing (Fig. 1). In the atmosphere, inclusion of the dynamic consequences of mountain waves is known to be important for accurate weather forecasts. Nikurashin and Ferrari argue that internal lee waves may be prominent in places where strong deep flows encounter rough topogra- phy. In particular, their theoretical calcula- tions highlight the Southern Ocean, where the strong Antarctic Circumpolar Current flows over the rough topography of Drake Passage, which lies between South America and the Antarctic Peninsula. They propose that turbulent mixing associated with breaking internal lee waves, when globally integrated, contributes one-third of the mixing required to trans- form the deepest dense water into less-dense water.